Today's random set is 2848 Flying Machine, released in 1997. It's one of 11 Castle sets produced that year. It contains 19 pieces and 1 minifig. It's owned by 955 Brickset members. If you want to add it to your collection you might find it for sale at BrickLink or eBay. I love the realism of all of the castle sets. Not one of Castle's most inspired designs, is it? Still, it's a good parts pack. You get a bat, a chrome sword, a flame piece, the crystal ball, the Bat Lord. I mean there were worse sets. As a Castle collector who had every set from 1984-1995, it was sets like this that sent me into my dark ages. What is this? I bet this set was made on "Bring your kid to work" - day at The Lego Company. Maybe it was meant to be a jet-powered kayak, or something? But there was a miscommunication between the art department and the set designer ('s kid)? Hands on the ball at all times! Bring back Castle! Just.. not this kind of castle. I love this. It's the sort of thing I build with left overs from other sets! When the set design is so odd, you don't even know what to call it. I had a couple of these and I’m still not sure how it’s supposed to fly. Just via that tiny flame from the back? You could at least have given it bat wings or something, Lego! I don't think I've actually seen this set before... almost mistook it for 2539, which had the same name but at least had wings to make the flight idea mildly more plausible. Then again, this was the castle line that had a witch and dragons, so the answer to how it flies is probably... magic. I got one of these. I must admit, I didn't have any intension of building it. Almost every piece was useful, so I used them in various MOCs. This may be one of the worst sets from one of the worst Castle sub-themes. The one of the first online reviews I read summed it up well, "Space and Castle don't mix." I'm glad didn't pay much for this, the shipping cost more than the itself. I have this set, and I loved the fantasy behind it. 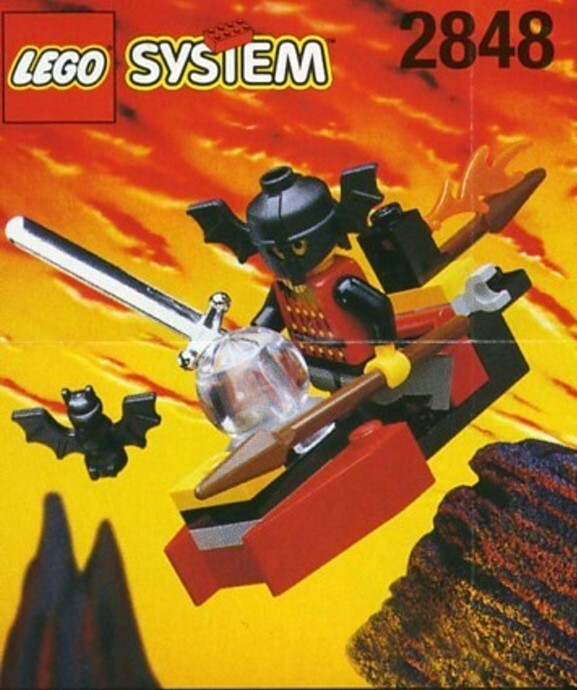 Like this same theme had a witch and dragons, so maybe the crystal ball channeled some power into this to make it fly, he's Basil the Batlord after all. How... How does it fly! Regardless of this set's quality, I always loved Basil the Batlord. I'd love to see him and Valdek reappear sometime with more modernized printing! What a horrible mishmash of parts! What a mishmash! But still, spear, crystal ball, bat, and CHROME SWORD! Basil: Are you completely certain this machination is capable of flight? Witch: Oh, fly indeed, Bat Lord! Just sit in there and you shall soar like the bats you command!